Doing the layout of the pram is the part that I was dreading the most. Although the plans seem to have all of the details required, they aren't exactly as easy to digest as plans that you can buy from most of today's designers. 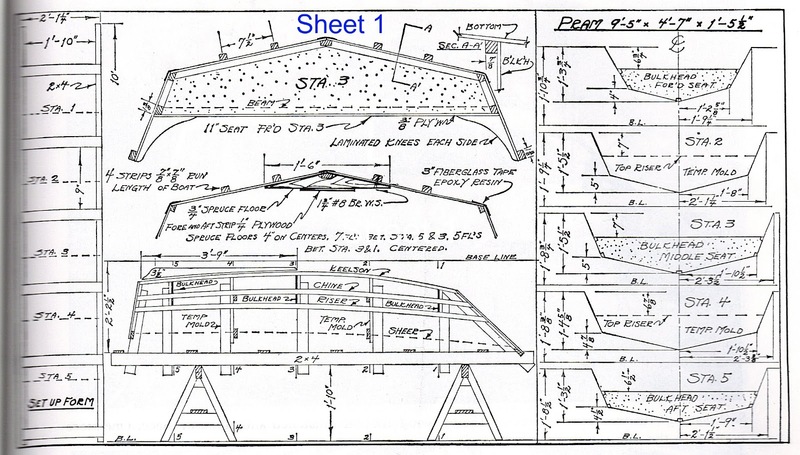 John Gardner gives his drawings in a traditional drafting format. This means that, rather than having all of the dimensions where they would be most useful, they are spread sparingly across all sheets drawings. While I understand the rational of doing it this way, it doesn't make it very easy for actually figuring out what to do. I'm going to describe the steps that I've used to draw out the pieces on wood. If, like me, you aren't very comfortable with his style of plans then this might be helpful. Otherwise, you might want to skip to the next post. Note: I've labeled each of the 3 sheets (to the left) with numbers to help with my descriptions. On the sheets in his book they aren't numbered. 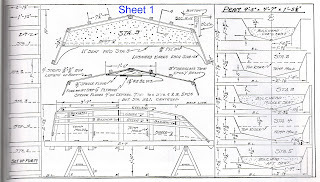 John's plans give indications on sheet number 3 on how to nest the pieces on the plywood for the side and bottom pieces. He doesn't do the same for the bulkheads. So, here are the steps I took. I'll only put the steps for station #1. The rest will be the same. Note that some of my measurements below will be in the format of x-x-x which represents x feet, x inches and x eights of an inch. All of the station measurements are in this format on the plan. First I used a chalk line to create a center line 2' 3 1/2" from the edge of the plywood. This is the distance of the longest half-breadth (station 3) as found in the table of stations. Measure across the chine-line the chine width. (1-2-5) Repeat on the other side. Connect the chine to the bottom point on each side. Measure across the sheer line the distance of the half-breadth of the sheer. (1-9-2). Repeat on the other side. Connect the chine to the sheer on both sides. Mark the line midway across the bulkhead (the distance from the sheer to the top of the bulkhead). In this case 6 3/4" from the sheer. With stations 1, 3 & 5 the bulkheads don't use the entire area of the bottom to sheer. As noted on the drawings on sheet #1. This means that you can overlap each of those stations on the plywood to save on material. It makes the layout look kind of messy but it saves a lot of wood. In the image above, the top 3rd of the section does not get used but it is required for layout to get the right angles.